Department of Botany, Molecular and Applied Mycology and Plant Pathology Laboratory, Centre of Advanced Study, University of Calcutta, 35, Ballygunge Circular Road, Kolkata - 700019, West Bengal, INDIA. Introduction: Mushrooms are a good source of bioactive components and have been traditionally consumed across the globe for maintaining health. However, information concerning medicinal activity of ethnically popular macrofungi still remains limited. Aim: Therefore, the present study was aimed for determination of functional constituents and therapeutic efficacy of a less explored mushroom, Macrocybe lobayensis that has been habitually used in local diets. Method: In this context, an ethanol extract was prepared from dried basidiocarps and characterized by spectrophotometry and HPLC to identify bioactive constituents. Alongside, the fraction was also subjected for evaluation of medicinal properties namely antioxidant and antibacterial effects. Results: The formulation was found to be consisted mainly of phenolic compounds (pyrogallol> cinnamic acid> p-coumaric acid> p-hydroxybenzoic acid). As a result, the fraction exhibited strong antioxidant activity evident by the ability of quenching DPPH and ABTS radicals, chelating capacity of Fe2+ as well as reducing components with EC50 of 1000 to 2264 μg/ml. Besides, the formulation also emerged as a potent source of antibiotic as it inhibited growth of investigating microbes in order of Staphylococcus aureus> Escherichia coli> Bacillus subtilis> Salmonella typhimurium> Listeria monocytogenes. 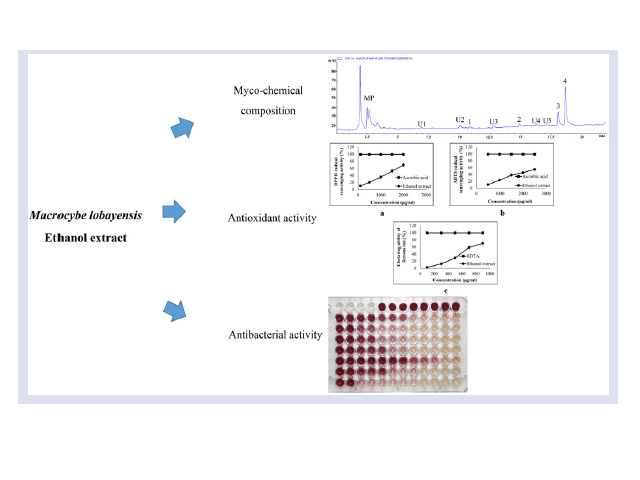 Conclusion: Thus, the outcome might encourage use of M. lobayensis as natural antioxidant and antibacterial agent in pharmaceutical, cosmetic or food industries. Khatua S, Acharya K. Functional Ingredients and Medicinal Prospects of Ethanol Extract from Macrocybe lobayensis. Pharmacognosy Journal. 2018;10(6):1154-1158.